To many individuals, the concept of colored diamonds seems quite strange. 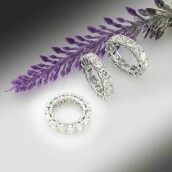 After all, diamonds are known for their glittering beauty, and magnificent shine. However, fancy color diamonds offer a lot that many aren’t aware of. Additionally, natural colored diamonds are in their own category; they are different than white diamonds because of their rarity and their magnificent colors. There isn’t another colored jewel that displays the brilliance like a diamond, not to mention the strength and durability that colored stones possess. So, why buy colored diamonds? 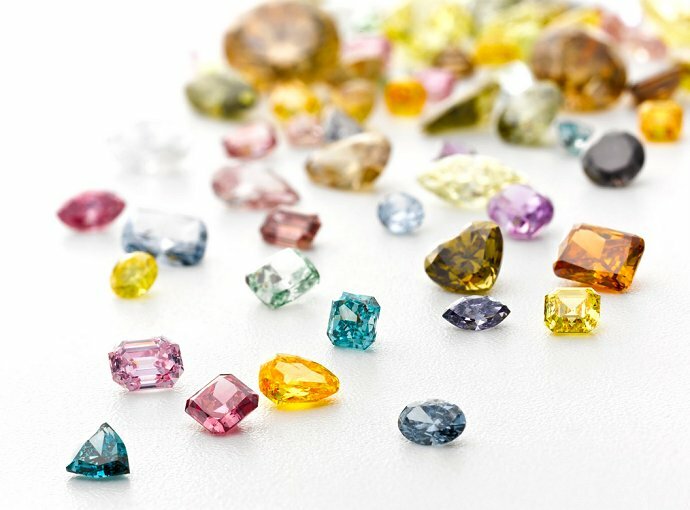 The uniqueness, the rarity, the beauty, the wide range of colors and prices, the prestige, and the investment potential each stone holds, are only a few of the many reasons why colored diamonds are so sought after. Royalty has worn colored diamonds for generations, and now the modern royalty, otherwise known as celebrities, have embraced the trend as well. 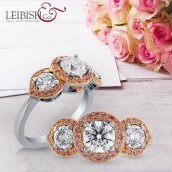 Since it is a known fact that consumers and individuals turn to the stars for fashion tips, there is no denying the fact that owning a colored diamond jewelry piece can instantly provide you with the status of being “like the stars.” From Queen Elizabeth, who received the famous Williamson Pink for her nuptials, to celebrities such as Beyonce, Jennifer Lopez, and Victoria Beckham, there is no shortage of celebrities who have donned colored diamonds. Hollywood stars are walking the Red Carpet with the most magnificent jewelry designs made of yellow diamonds, black diamonds, and more. Imagine walking down the street with a large diamond ring on your finger. You are likely to draw attention and perhaps a few “oohs” and “ahs” and perhaps even questions regarding the size and clarity of the diamond. Now, picture that ring as one with a stunning colored diamond. When eyes catch sight of the stone, not only will it receive “oohs” and “ahs” but also fascinated looks and curious comments such as, “is that a diamond?” and, “wow, I didn’t know there were colored diamonds! That is so unique and different, one of a kind!” If unique and different is what you are after, then a plain colorless diamond will just never do. You will never cease to draw attention, stand above the rest, and needless to say it will be a constant conversation starter. Colored diamonds are not just alternatives to traditional colorless diamonds, but they are also wise and promising investments as well. Because of both the limited colored diamond supply in the world and the high demand, the price of colored diamonds is escalating at a rapid pace. 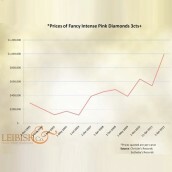 Over the past ten years the value of colored diamonds has increased significantly. Many serious investors seek out specific stones that have demonstrated extraordinary price increases, such as Argyle Pink Diamonds, and Yellow stones with a high clarity grade above 2.00 carats. If spending so much on a precious jewel does not sit well with you, know that this purchase will pay off. Not only will you own an exquisite stone, but you will also have made some profit. Colored diamonds do not have to cost more than you are interested in paying. Depending on the color, the size, and the quality of the diamond you can find them in almost any price range. Additionally, there is a color to suit every personality. In the World of Colors, there are twelve colors, and over 230 different color combinations! Though some colors are quite hard to find, and can be quite expensive, many are readily available and affordable. This makes a colored diamond an attractive option. From pink to purple to yellow to brown, the options available are endless. While diamonds are already considered rare items, hence their high prices, colored diamonds are far more difficult to find, especially particular colors. If you are into unique and rare items, colored diamonds are definitely up your alley. As time goes by, it is becoming harder and harder to find colored diamonds of substantial sizes. Purchasing and owning one allows you the honor of having a rare and valuable natural and historic specimen in your belonging that can be cherished for generations. Asking “why you should buy a colored diamond?” is a legitimate question considering its rarity; not to mention the research one should conduct before purchasing the stone. Finding out about the many advantages they offer can help you feel at ease with your decision. 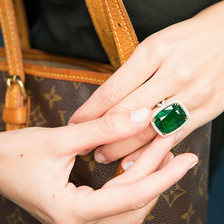 Colored diamonds are truly special and those lucky enough to own one should understand all of its remarkable qualities.